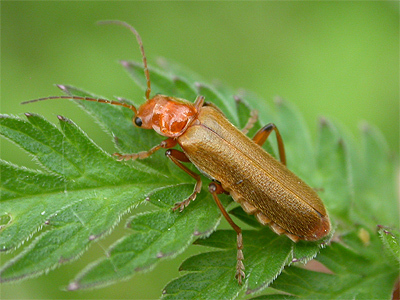 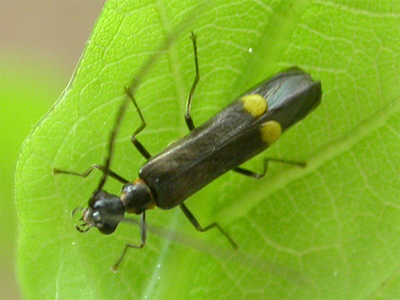 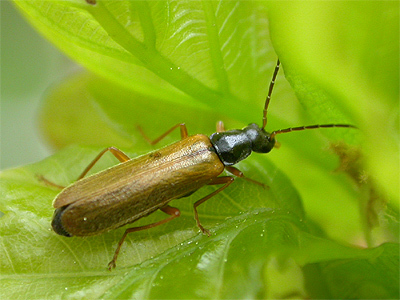 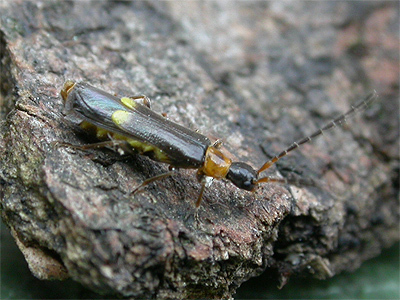 There are about 40 UK species of Soldier Beetles which belong to the Cantharidae family of beetles. 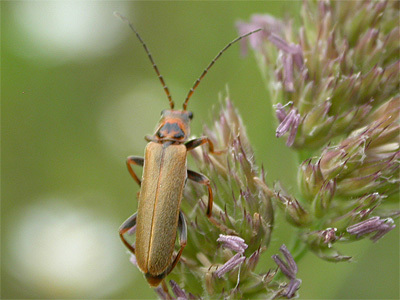 Many species are common in Nottinghamshire and are a frequent sight on thistles and umbelliferous flowers during the Summer months. 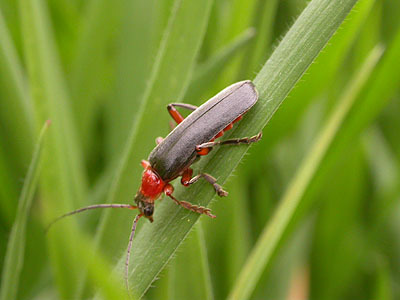 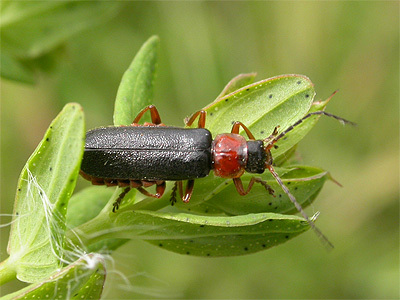 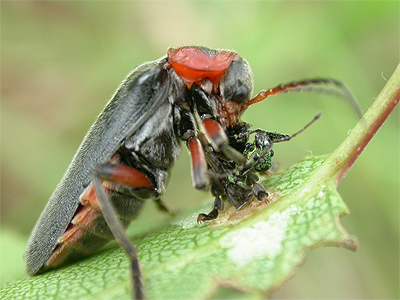 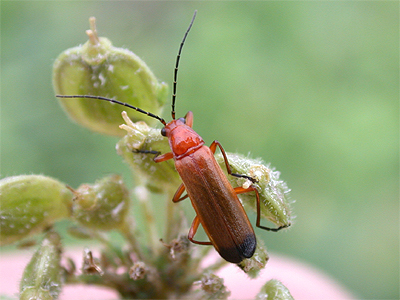 Some red coloured Soldier Beetles (notably Rhagonycha fulva) were often commonly referred to as Bloodsuckers by schoolboys, but they are completely harmless. 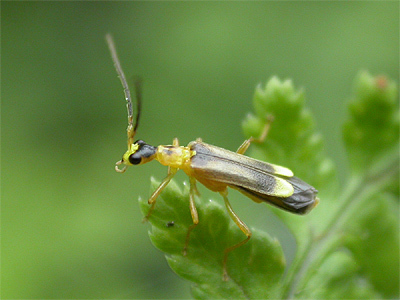 The identification of individual species is not always easy, although with practice, many can be readily identified in the field. 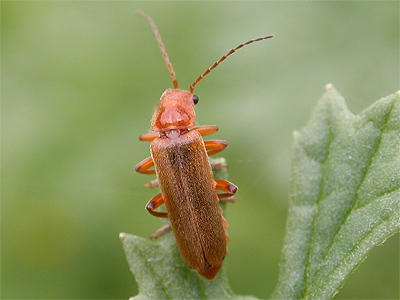 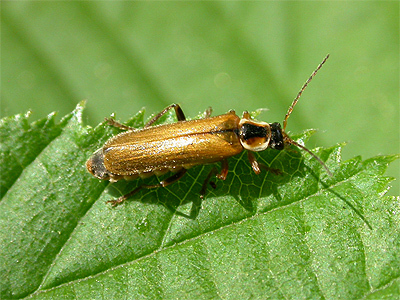 There are certain pitfalls when identifying any Soldier Beetle, but the purpose of showing them collectively here, is to create an awareness of the range of species found within most areas of the Nottinghamshire countryside. 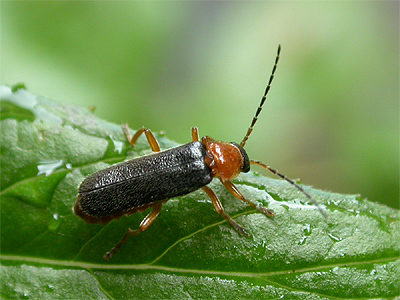 Markings and sizes vary per species and (as in most insects) there are also variations within species. 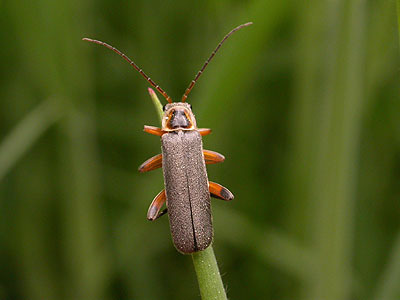 Most are easily found on long grass, flower heads and other foliage. 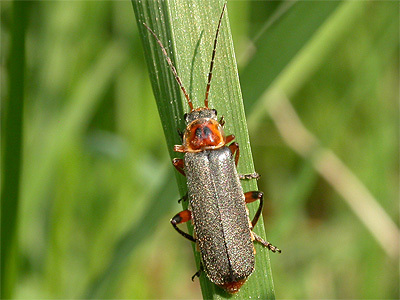 They are generally conspicuous beetles and in the case of Rhagonycha fulva, often sufficiently common enough to the point of being abundant at any one site during the late Summer. 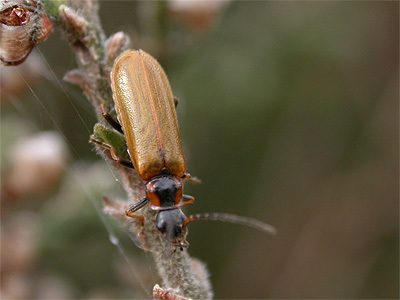 Cantharidae larvae are velvety in appearance and live just under the soil surface or in leaf litter and are carnivorous, feeding on a variety of smaller invertebrates. 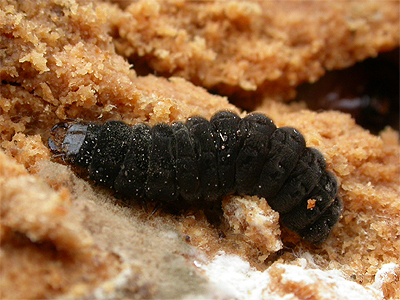 We have only recorded larvae twice, with the one above (species unknown) being found within a well rotted, partly buried branch. 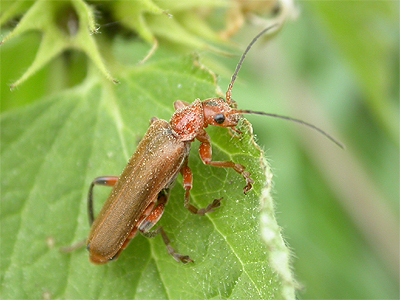 The adults are also carnivorous insects and are greatly attracted to the nectar of flowers, but flowerheads also provide useful vantage points, so they probably catch and eat other flower visiting insects. 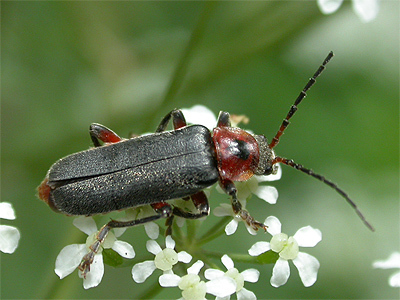 Nottinghamshire does relatively well for its variety of Cantharidae and it seems that just Malthodes fibulatus and Malthodes flavoguttatus, have not been recorded anywhere in the county in recent years. 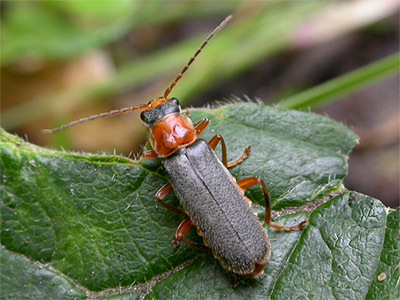 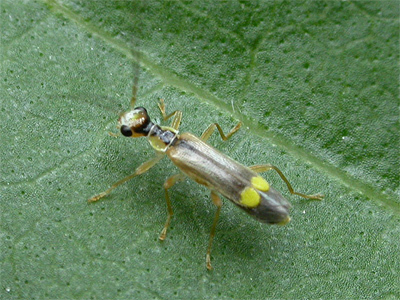 The following list of Cantharidae recorded in Nottinghamshire, is believed accurate.